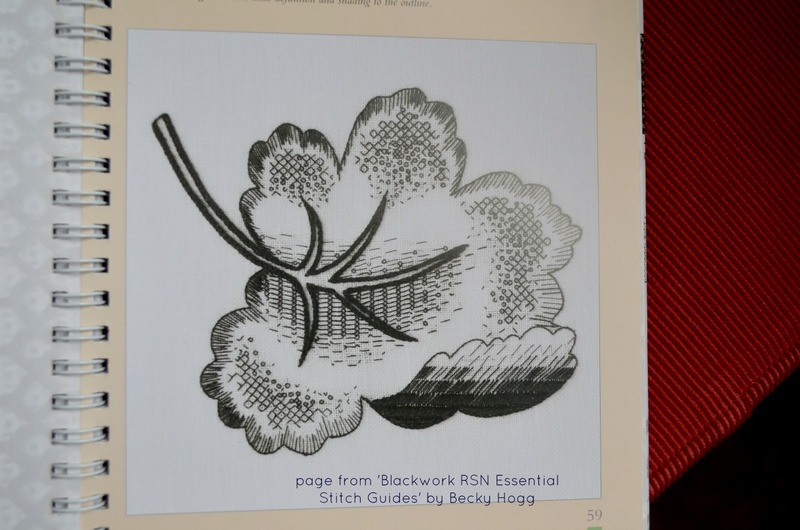 One of the gifts I received for my birthday was this book about Blackwork by Becky Hogg. This publication by the Royal School of Needlework is only 96 pages but for me it is a perfect addition to my stitchy library. 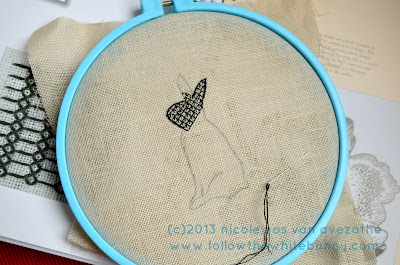 There's a short history of blackwork embroidery, a chapter about materials (funnily enough cheap bright blue plastic hoops aren't required), design and transferring. Of course there is a chapter about Stitches. Blackwork is limited in the number of stitches it uses and you will not need to learn any new stitches if you already know your 'basic' embroidery stitches. There are lots of different patterns to be found in this book with diagrams and stitched examples. And with patterns I mean 'filling' patterns like diamond and hexagon shapes, not bunnies and hedgehogs. The patterns are followed by chapters on different Shading techniques. That's my favourite section of the book, it's amazing what you can do with variations in pattern, type of thread and stitches! Of course I had to give Blackwork a try too (see top photo) and grabbed some even weave fabric (not sure of the count 32 possibly?) and black floss. I drew a Jackalope (not sure yet how to tackle the antlers so haven't added them yet) on the fabric with a regular pencil and started filling it with a simple diamond pattern. It's far from perfect. Problem is that with my eyesight I can hardly see what I'm doing so it's really time to get a magnifier for detailed work like this. As it happens there was a review of an interesting magnifying tool called Craftoptics on Needle 'n Thread today. It would certainly do wonders for adding a Steampunk touch to my look (and possibly help me with my stitching too) but sadly it is a little too expensive for me. Im too new to embroidery to even attempt black work, but I think it is fascinating to see what can be made just by shading. I really like your blackwork and I can't wait to see the antlers!